Mondays. They just keep happening. Over and over again, right? I have a friend that LOVES Mondays. She sees a brand new start to a week full of possibilities. A start to crossing off things from her to-do list. And she gets things done. I see Monday as a start to a week of eating. Seriously. I do. And it’s fabulous. I once heard an interview with Keith Richards talking about Mick Jagger – He said that he (Keith) wakes up and thinks “ok, I have to get upright and walk now. Mick gets up and is already planning what he’s eating for dinner that night.” I am wildly paraphrasing. But I guess I am like Mick. Huh. And if you don’t know who these people are that I’m talking about, it’s really ok. But I digress. But, I have it on good authority that Mondays can be repeatedly stressful for families trying to juggle work, kids at school, after-school activities and getting dinner on the table without driving-through somewhere for an “easier” night. With all the things we compromise in the name of saving time these days, dinner (and meals in general) should NOT be one of them. Monday sets the tone for the rest of the week, so let’s try to think this out. Or not. What if I told you that drive-through wasn’t necessary? That you could have a whole, delicious, satisfying meal ready and on the table in 20 minutes or less with a bit of preparation earlier in the weekend. Let’s try to make Mondays brainless. Let’s have a Brainless Monday Meal™. Brain. Less. This applies ONLY to dinner. Please use your brain responsibly with every other activity. 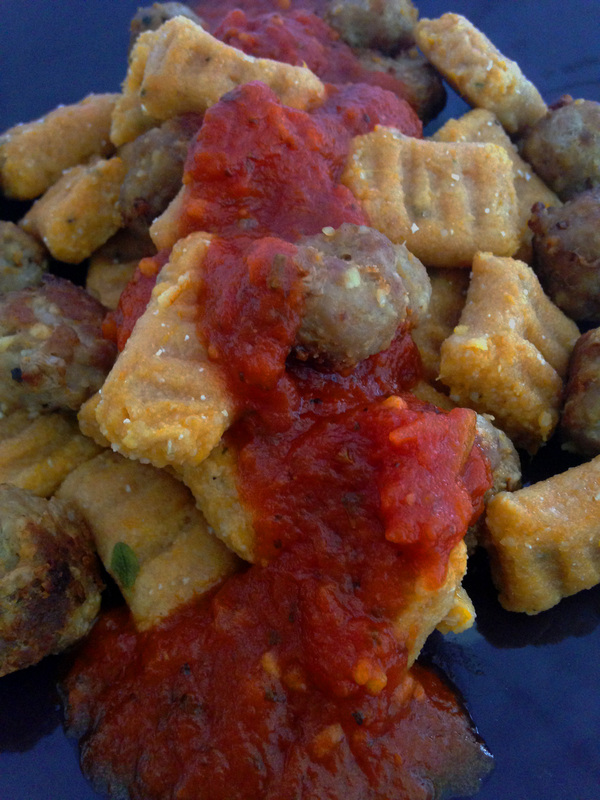 How about Egg-free Sweet Potato Gnocchi with Mini-Meatballs and Red-Sauce? Yes. But that’s neither here nor there. Say it with me: It’s easy. It will be premade. It’s Brainless Monday™ food. I didn’t hear you. It’s ok, I trust you. Ready? OK, first run to the store. Drive, drive to the store. Here’s your shopping list: yes, you do have to go to the store – it’s where they have all of the food. Real food. If you have all of these ingredients in your house right now, then this is the beginning of a beautiful friendship. You should write a blog. But don’t copy mine, that would be rude. Now that you’re back from the store, let’s get started! Put everything away to keep the kitchen tidy and turn on your oven to 425. I know, I’m bossy. 1. Scrub those sweet potatoes and throw them in a pan and bake them until they are done. Easy-peasy rice and cheesy. 2. While the sweet potatoes are baking, get out your turkey and spices and nut/grain flour. 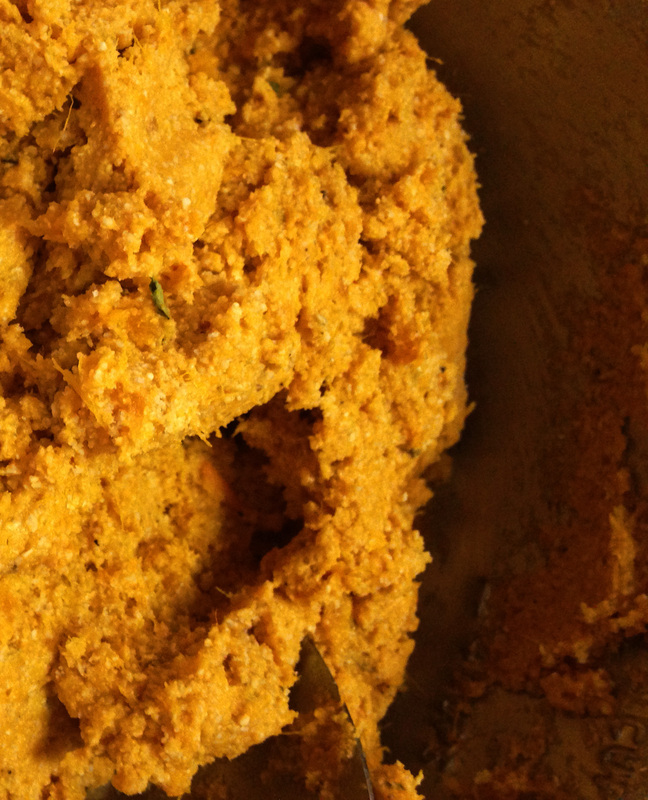 The reason I use cashew flour is that we are a low-carb household. 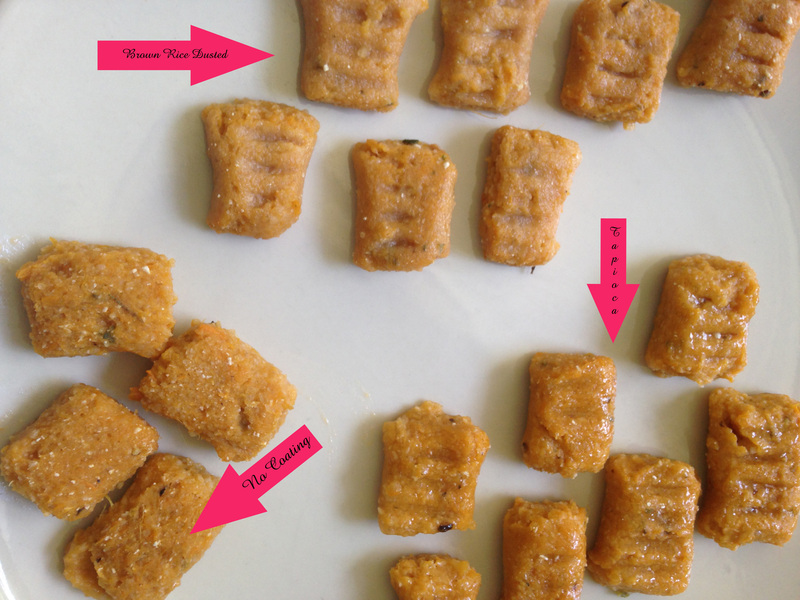 We have to watch Padme’s carb count and blood sugar, so cashew flour is a low-carb/Paleo alternative to rice flour. It also is pretty neutral in taste, like a breadcrumb. If you have a coffee grinder, you can refine your nut flours to a more fine consistency by running small amounts through your grinder – careful though! Don’t turn your nut flour into nut butter. You will have to buy a new coffee grinder. 3. Put the turkey in a large bowl, and add 1 cup of nut flour or 3/4 cup of brown rice flour. Add in 1 tbsp. of dried oregano. ∗Helpful hint from Heloise – if you rub the dried oregano between your fingers as you drop it into the meat, it will release more flavor to your mix. It’s an essential oil thing. Add in 1 tsp salt, and 1/2 tsp pepper. Mix all of this together until blended. I cannot stress this next part enough – make all of your meatballs now, and place them on a plate BEFORE you start cooking them! Or, you may find yourself scrambling to fill up your pan with tiny meatballs quickly. 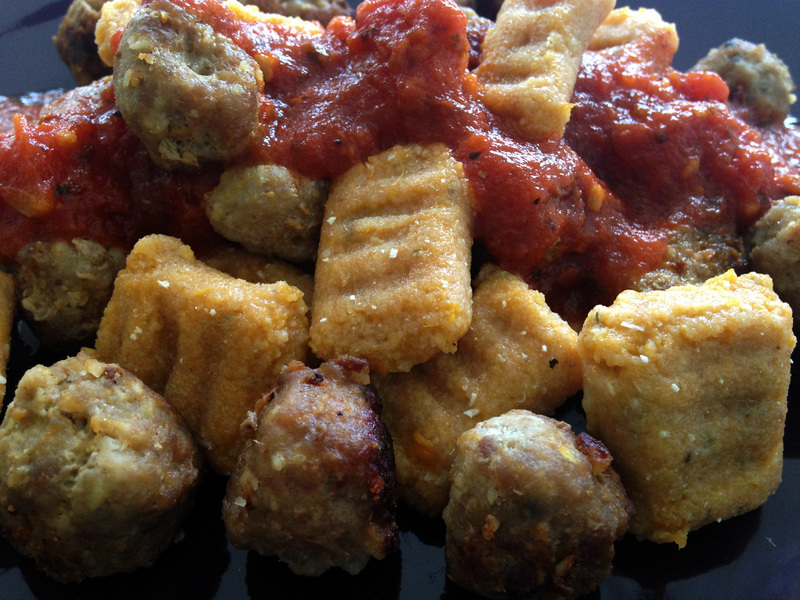 Learn from my mistakes…… I love tiny food, so I made-mini-meatballs. They are about 1 inch around. They cook quickly, and they are a perfect size to accompany the gnocchi. 4. After all the meatballs are formed, and your sweet potatoes are cooking nicely, add 1-2 tbsps of oil & heat your skillet to medium high. We normally cook everything in coconut oil, but I used palm-oil shortening here. Bacon grease would be divine. Set out your vegetable broth. When your skillet is heated and you have a lid handy, start placing the meatballs closely together in the pan. When the pan is filled up with yummy meatballs, and the heat from the pan has seared them and the smell in the kitchen is divine – add in 1 cup of vegetable broth, reduce heat to medium and cover the pan. The vegetable broth adds depth of flavor to the meatballs and also enables a quick, effortless release from the pan. Cook until done – I don’t give times to cook meat, turkey should be well done but your mileage may vary depending on your stove. Repeat until all of the meat is used up. Don’t waste. 5. After all of the meat is cooked, set aside, cool, and refrigerate. 7. Set out a clean fork and knife. Put a large pot of water on the stove. DON’T start it boiling yet. Again, learn from my mistakes. Get ALL of your gnocchi prepared BEFORE you start cooking. Lightly flour a cutting board with brown rice flour, and have another large surface/plate ready to place your pre-cooked gnocchi on. You will need to re-flour your board with each batch you roll out.Taking 3/4 cup of sweet potato mixture out, and roll into a ball in your hands. 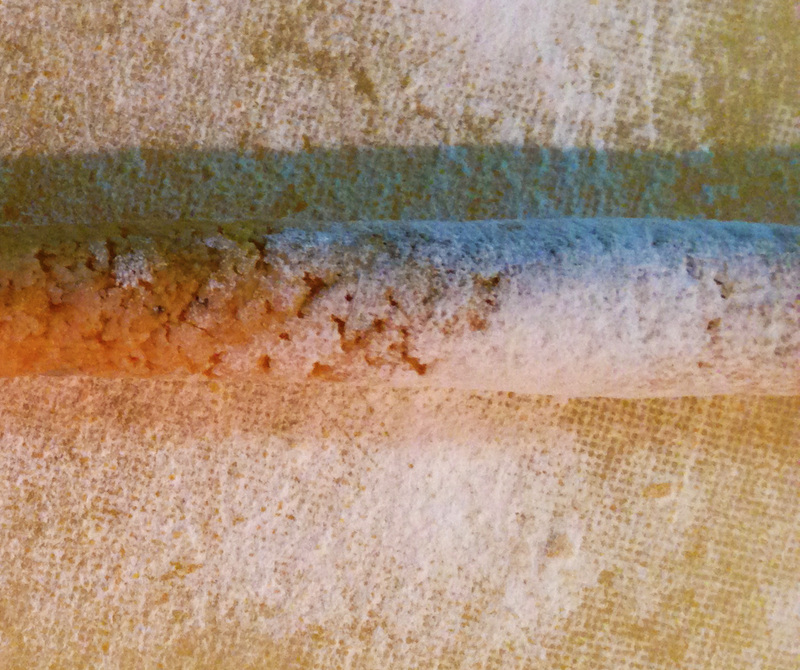 place on the floured surface and remembering your Play-Doh days, roll out a log about 1/2 inch wide. There are two pictures below, one of a log floured with brown rice, and the finished product rolled in tapioca/brown rice/or nothing. They all taste the same, but you can see how different flours create different outer textures. Tapioca starch produces a shiny, sticky exterior, brown rice flour creates a matte texture, and no coating makes a rustic looking gnocchi. 9. 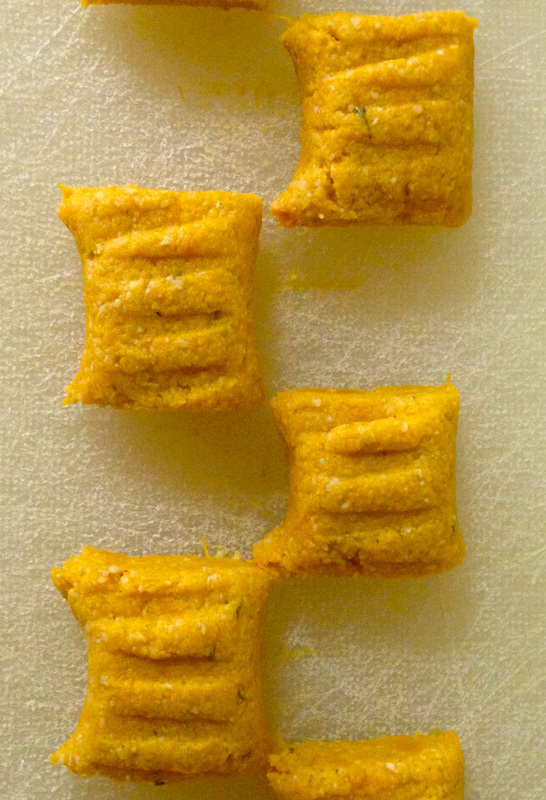 Cut gnocchi into 1 inch sections, and set them aside on your plate/covered surface. Be sure to have a place to put your cooked gnocchi after it is done. Once they all are cut, start your water boiling. 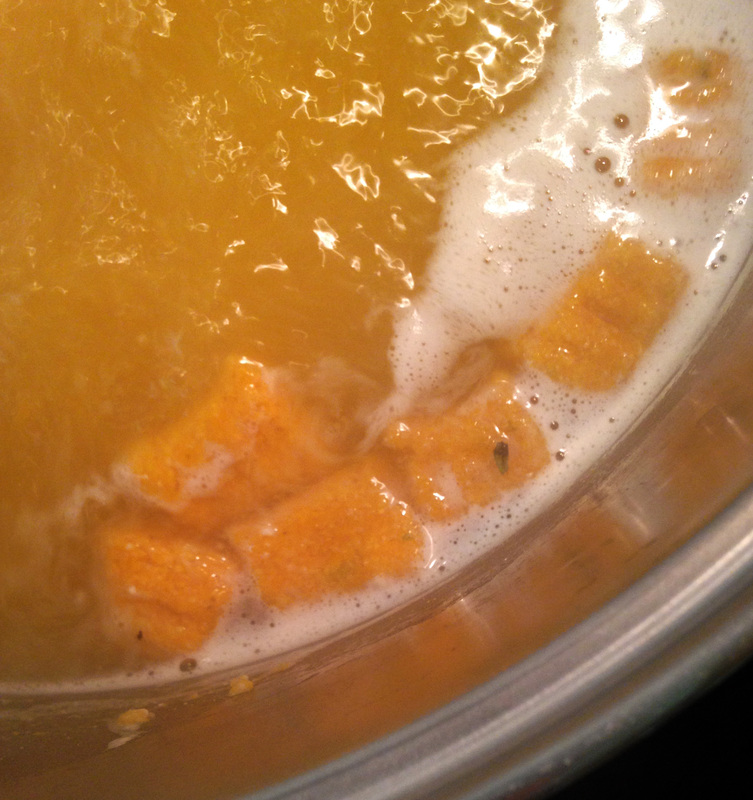 When the water comes to a rolling boil, start putting your gnocchi in, about 15-20 at a time or however many your pot will hold without crowding. They will sink. You have not failed. They’re supposed to sink. RESIST the urge to stir them! The gnocchi will rise to the top by themselves. They take about 2 minutes in total to rise and cook. Using a slotted spoon, scoop the ones that have risen to the top out, let the residual water drain off and then place then on your plate. Drop in the next bunch. If your pot will hold more than 15-20 gnocchi – go for it! The recipe makes about 200 gnocchi. That’s a bunch. The water will now start turning bright orange – it is supposed to! 10. Repeat the process until all the gnocchi is cooked. Turn off the stove. I know, bossy. So there you have it. Sweet potato gnocchi. Serve with meatballs and spaghetti sauce on top. Maybe a bag of prewashed salad so your meal looks pretty AND nutritious? 1. Eat half of it all tonight and put the rest in the refrigerator until Monday night when you can brainlessly have dinner on the table in about 10 minutes. 2. Place half of the gnocchi, flat in freezer-safe bags and freeze for a Brainless Monday Meal™ in the future. (To reheat frozen gnocchi, bring a smaller pot of water to a boil and drop the amount of gnocchi it will hold into the boiling water. When they rise to the top, cook for about 1 minute more and they should be heated through.) Refrigerate the rest for this Monday’s dinner. 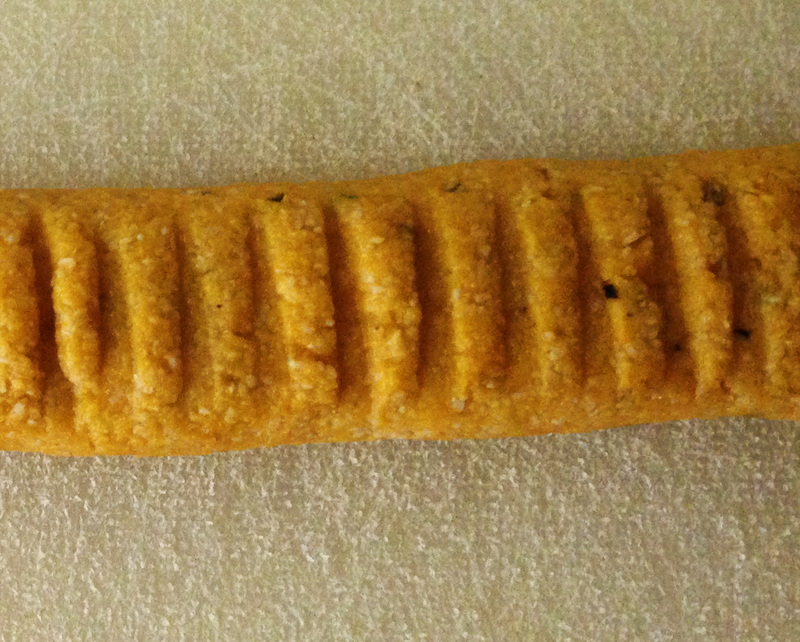 Try not to snack on it before then. Or go ahead and spoil your appetite. Enjoy giving your brain Monday night off! The next Brainless Monday Meal™ may contain but is not limited to: Marinated Balsamic Strawberry, Cilantro and Avocado Salad, Out-Cold Turkey Wraps and Chilled Quinoa and Lemon Dill Pea Salad.